Having your period may not necessarily feel like a reason to celebrate, but the first time that a girl gets it is a pretty momentous occasion. And Brooke Lee’s mom thought the same thing since she threw her daughter a period party. While it appears to have been a fairly low-key affair, Brooke’s mom Shelly is still our hero. 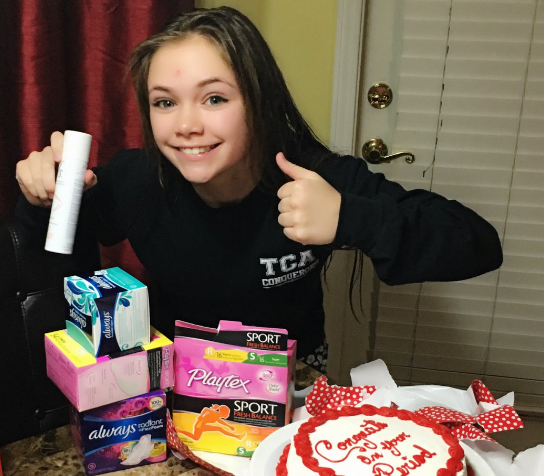 The period party has now gone viral since Brooke’s cousin Autumn Jenkins shared photos of the event on Twitter. While not every girl would like this type of attention about anything — let alone her period — that wasn’t the case for Brooke. "Brooke wasn't embarrassed by the period party." Autumn, who is 17, told Mashable. "She thought it was funny. It's kinda normal for our family to do something like this." The 12-year-old Brooke actually even seems to be embracing her newfound fame by tweeting about it. "I think that this story teaches girls, and even guys, that periods aren't a horrible or embarrassing thing. Its [sic] a milestone and [a] big part of a girls [sic] life." Autumn is absolutely right — your first period is a milestone. And now, we’re kind of wishing we had been given a party and a chocolate cake on our first period day.